I was just saying yesterday that these are one of my favourite flowers as I watched the bees and butterflies flitting around a bunch while we were stopped at a light. I always love looking at these flowers. Your photo is great. 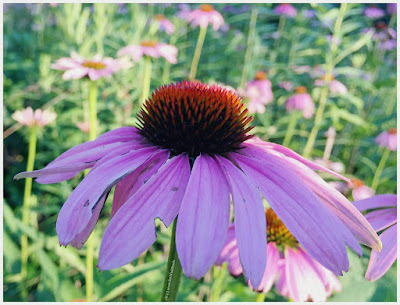 The coneflowers are lovely where we live, too (which is in Illinois). I love seeing all the wildflowers evolve through the summer. First there were wild strawberries and phlox, then Black-eyed Susans and Queen Anne’s lace. My favorite are the red poppies which seem so elusive. They don’t grow here as they do in the south of France. This is beautiful. Lovely shade of mauve. I love Coneflower's, purple ones are my favorite! Great shot, and nice background too. So beautiful! It is awful with these wildfires!